F SPORT PACKAGE Unique Interior, Side & Rear F SPORT Badge, Aluminum Pedals, downshift rev-matching, Sport-Tuned Adaptive Variable Air Suspension, sport-tuned stabilizer bars and shock absorbers, F SPORT Door Scuff Plates, Brembo Brakes, opposed 6-piston front brake calipers w/ventilated discs, Limited Slip Differential, Paddle Shifters, F SPORT COMFORT PACKAGE One-Touch Open/Close Power Trunk, Heated & Cooled Front Climate Control Seats, Power Rear Sunshade, RADIO: MARK LEVINSON REFERENCE SURROUND SOUND 19 speakers, 450 watts of power and less and 0.1 percent Total Harmonic Distortion (THD) and DVD/CD changer, PRE-COLLISION SYSTEM (PCS) All Speed Dynamic Radar Cruise Control, BLIND SPOT MONITOR W/REAR CROSS TRAFFIC ALERT, ACCESSORY PACKAGE (Z2) Cargo Net, Carpet Trunk Mat, Rear Bumper Applique, Key Gloves, Alloy Wheel Locks (PPO), BI-XENON HID W/INTELLIGENT HIGH-BEAMS & AFS, HEATED 3-SPOKE F SPORT LEATHER PADDED STEERING WHL Paddle Shifters. 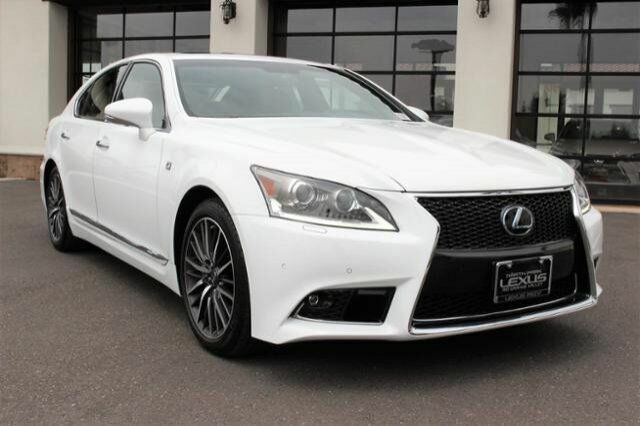 Edmunds.com's review says "With its whisper-quiet interior and luxurious ride quality, the LS 460 is all about pampering you and your passengers to an optimum degree of comfort and refinement. ".